Some of you guys have been asking for a wedding post and I'm not sure why it has taken me so long... Oh wait, yes I do... I just don't love wedding planning. I know that's a crazy thing to say and Pinterest tells me I'm supposed to love planning the cute little details... like mason jars which can be used both for drinks and for my guests to take home young saplings which will grow with the date of our wedding etched into the trunk. Okay fine, I made that part up. You get the picture though. 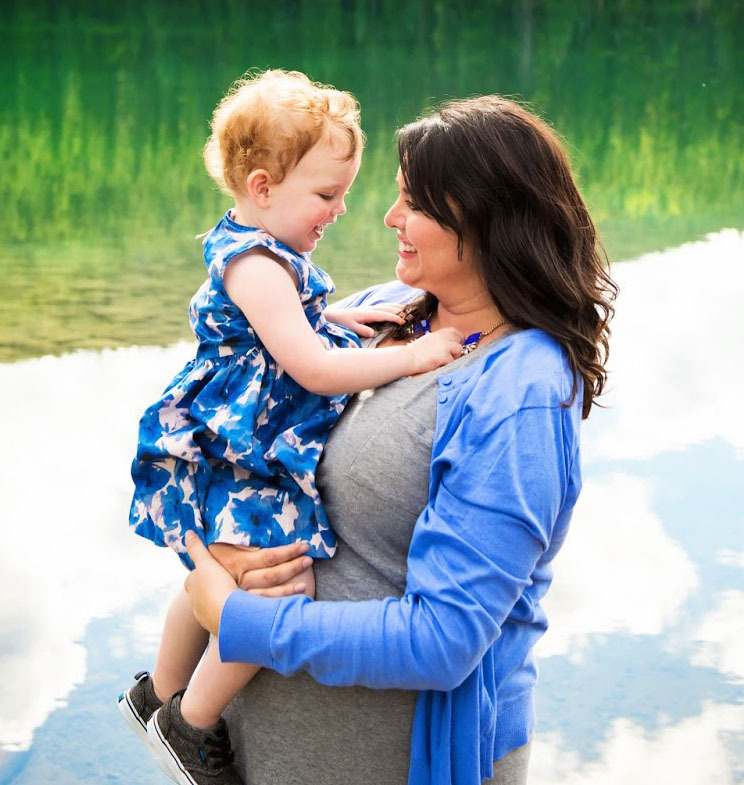 I think if I had more time and we hadn't filled our lives with so many other things, including busy jobs, I would take a little more pleasure in the planning process. Unfortunately, we both work long hours and spend our time on other things. Many people have suggested a wedding planner and even told us that they basically pay for their own salary in vendor discounts... Which would be fine... 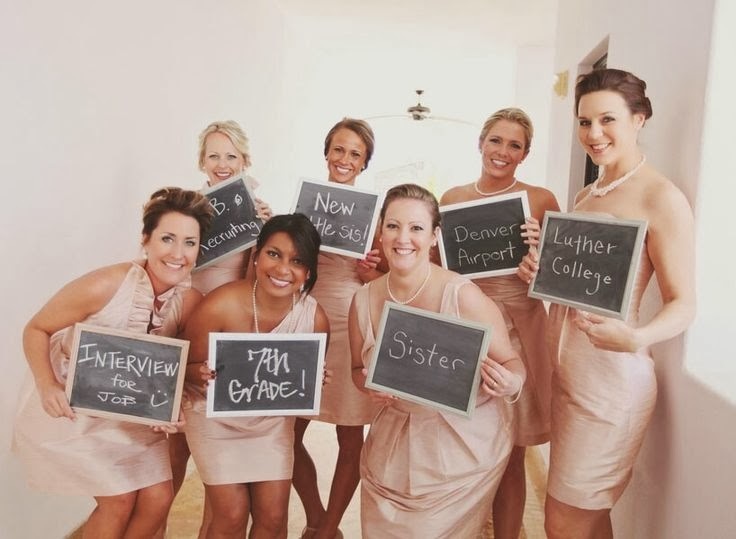 If we had an "average" wedding budget... but we're trying to keep things modest (Which, FYI is still an INSANE amount of money to spend on a party!) and even though I don't really take an interest in planning our wedding, I am too Type A to let a stranger do it. Perhaps the largest reason I haven't jumped on board the wedding train is that I'm just not sentimental about it and it just really isn't a priority. That being said, in the past week I have come to the decision that I am going to embrace this wedding. We have already decided to spend this money so I need to stop resenting that it is not going towards the house and start getting excited and planning to make it a great day for our family and friends. We had actually roughly planned almost all the big details at the end of the summer and then we didn't think much about our wedding for a month. Now we're actually signing contracts and paying deposits, seeing the money leave our accounts motivates me to focus on the fun aspects of the day! Which brings us to this post. I still don't have Pinterest boards filled with wedding inspiration but I do gather photos sometimes to remind me of things I like. I guess it's my modern version of hoarding magazine clippings. Today, I'm going to share some of them with you. I can't take credit for the inspiration board above. I found it through a Google image search and Wedding Window popped up. I have yet to read a bridal magazine or wedding blog... but I may come back to this one if I have time! 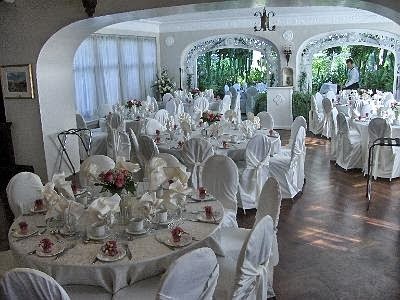 I had initially thought of a jewel toned colour palette but, now that we've secured our venue (photo below) I think an "Emerald and Jade" colour scheme would look great against the solarium in the ballroom. It's an old heritage house which is around the corner from the house I grew up in. I think I was sold when I saw the solarium and the large dressing rooms for the bridal party and learned the house is haunted. Corey, on the other hand, loved the herringbone wood floors and exposed beams. 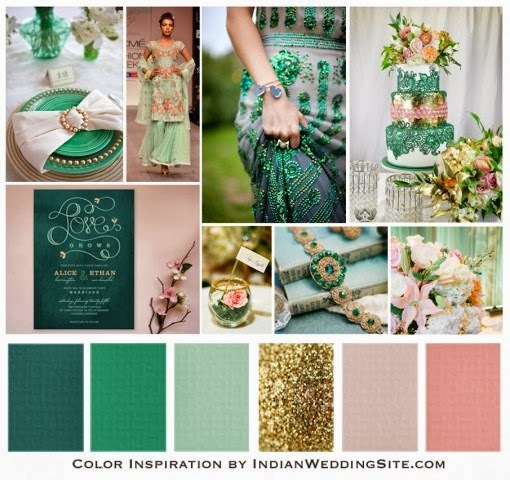 Indian Wedding Site also posted this inspiration board (below) in a similar colour scheme. 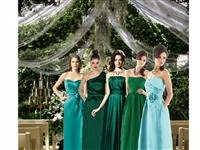 I also found this ultra blurry photo, which I kept because I liked the coordinating bridesmaid dresses. Remember when Corey proposed? It was outdoors at the summer camp where we first met. Since then, we've chosen two venues (one for the ceremony and one for the reception), a photographer, caterer, interfaith officiant and one of our friends was generous enough to gift us a DJ! We also have a rough playlist and timeline and have made many of the logistical decisions, which will make the day run smoothly. We, like many modern couples, struggled with the registry dilemma. I was torn because we don't really need a bunch of small things but I also wasn't comfortable with an all cash registry. I think I found a good compromise in the end, which mixes elements of a more traditional registry with our more modern take. We've included some traditional items like new bedding and towels but also given our guests the option to help us with larger purchases like our honeymoon or kitchen remodel. For the large items, I broke them down into smaller "pieces" which people can purchase if they want. It was hard for me to wrap my head around doing it this way... 20 years ago, it would have seemed so tacky. Still, it's undeniably practical so my sense of reason won out! 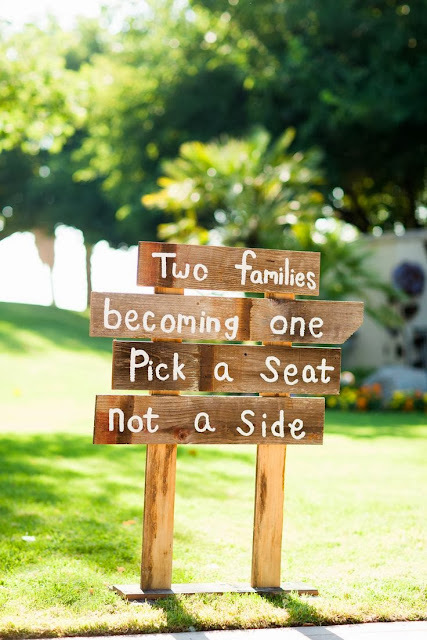 While we don't want a kitchy themed wedding, we are trying to incorporate some camp-based elements into our wedding day as a nod to where it all began! 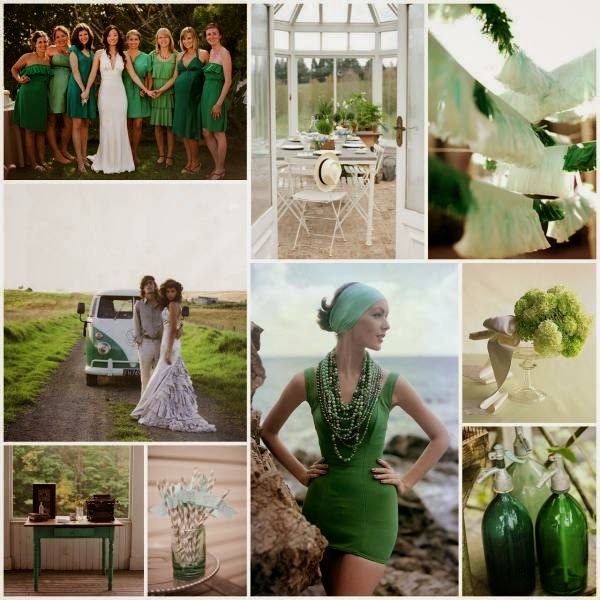 Below I'll post some inspiration photos that we've collected from Pinterest. Unfortunately most were pinned without the original source. 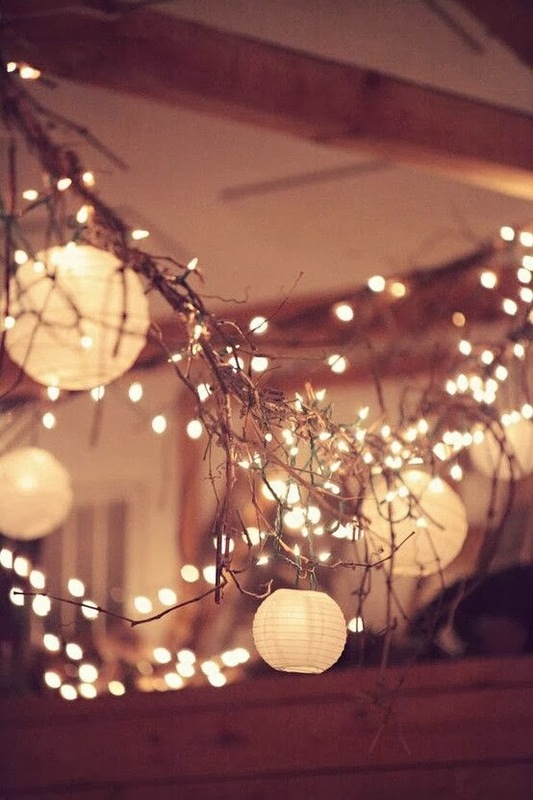 I guess I'll be stocking up on fairy lights after Christmas this year because if Pinterest has told me anything it's that I'm a failure as a bride if I don't have fairy lights everywhere. 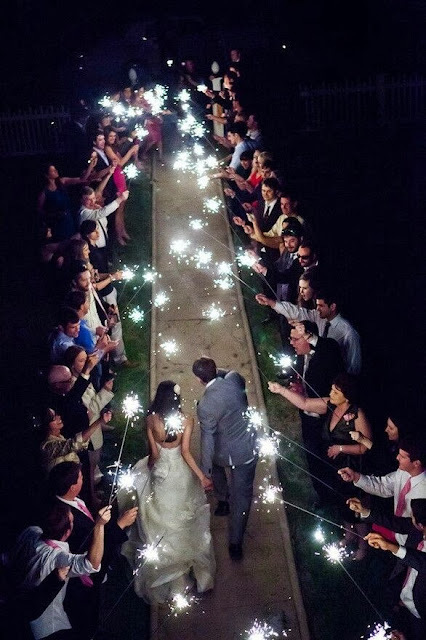 I really loved the mix of lights and lanterns in the photo below. I also love the idea of walking through a tunnel of sparklers. It would be great for pictures and it could mean that Corey and I get to exit a little early... because we'll be pooped! Seriously, it's so dramatic and pretty, right? Just cross your fingers that my trademark clumsiness doesn't rear it's ugly head because I don't really want to end up in the burn unit on my wedding night. I love this idea for the ceremony. I've always thought it was a little awkward that people have to choose sides... It's especially hard for mutual friends. 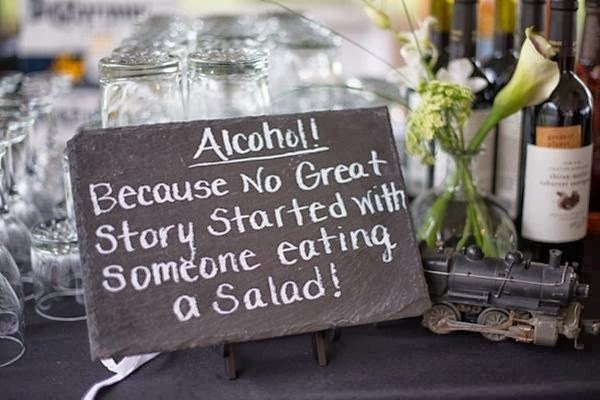 Basically, I like cute things written on shabby chic chalkboards. Which is ironic since I absolutely despise chalk and touching it or even hearing someone writing with it gives me goosebumps! I also liked this love timeline idea, but I already jokingly asked Corey if we could fudge it a bit so people wouldn't notice that we totally kissed on our first date. We both have family members and friends who are no longer with us. 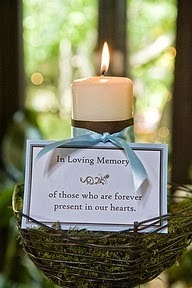 We're thinking of ways to honour them and remember them on our wedding day. This is just one idea. 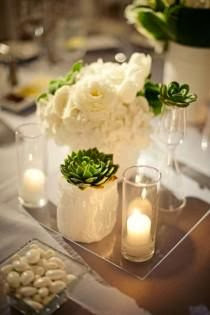 With an "Emerald and Jade" palette, I would love little succulent centrepieces. 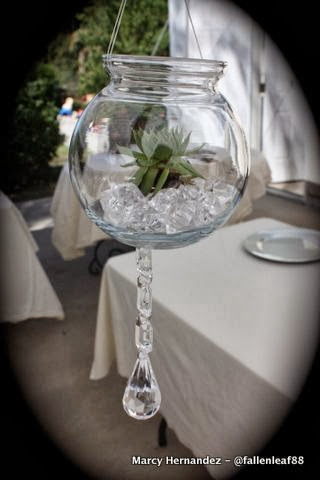 Succulents also look surprisingly great with crystal! Our ceremony will be mostly non-religious but we want to incorporate elements from both of our religions. 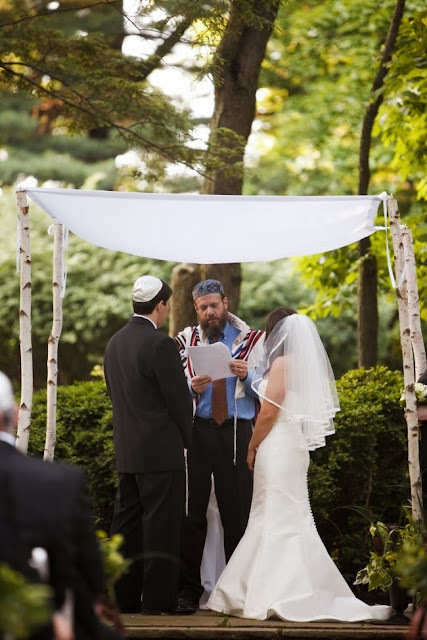 We liked this rustic chuppah. 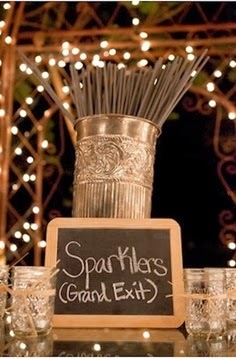 And here's a wedding DIY that I actually love. 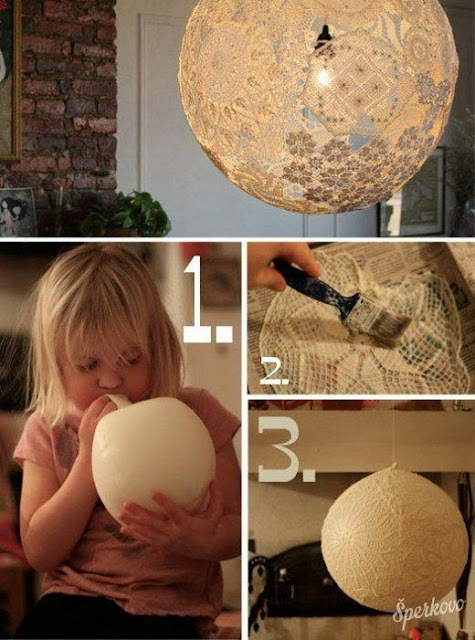 Wouldn't these lace orbs be pretty if hung from the ceiling? There are so many random small things you're supposed to spend money on. I had thought of buying a vintage birdcage and spray painting it gold to hold cards that people bring to the wedding. 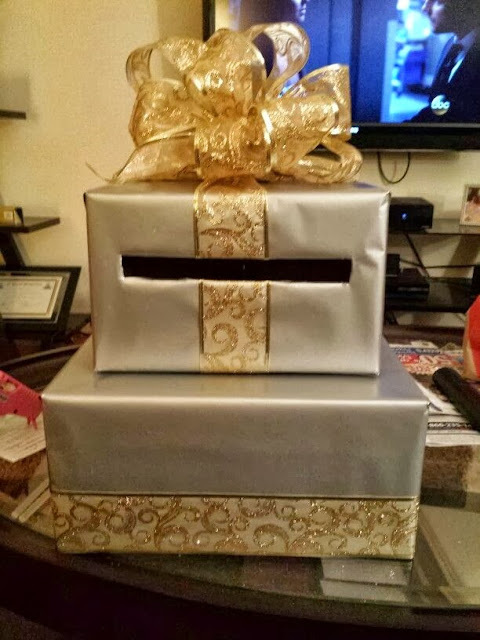 The photo below reminded me that I can also just wrap some boxes! 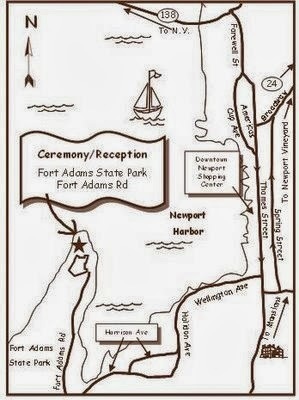 With our ceremony and reception in different places, I'm definitely including a little map in our invitations. 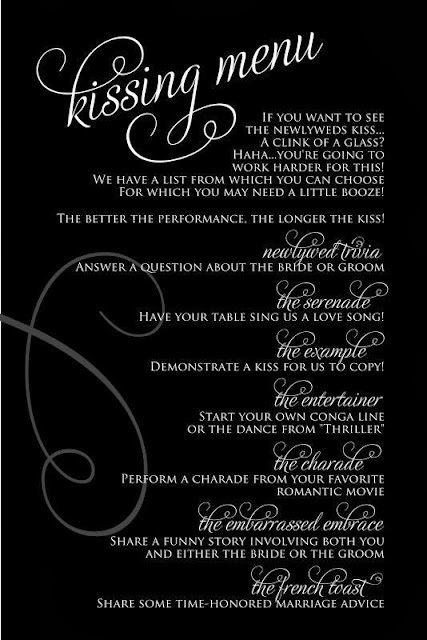 I don't LOVE this kissing menu... but it has given me some other ideas that will replace the traditional clinking of glasses. We totally want to include a little candy and snack table. 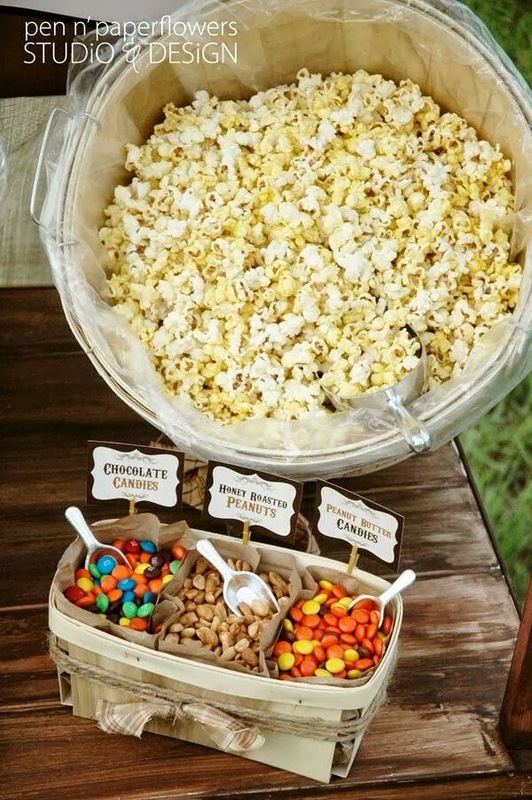 Ours will probably be less nutty (due to allergies) but we liked this idea! 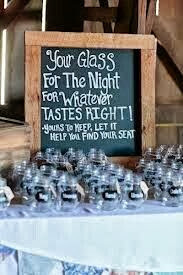 I adore this idea for my wedding party. We could also include funny (truthful) explanations for how we met like "She had a crush on my boyfriend in high school." or "Our moms forced us to be friends when we were little." Cute, right? 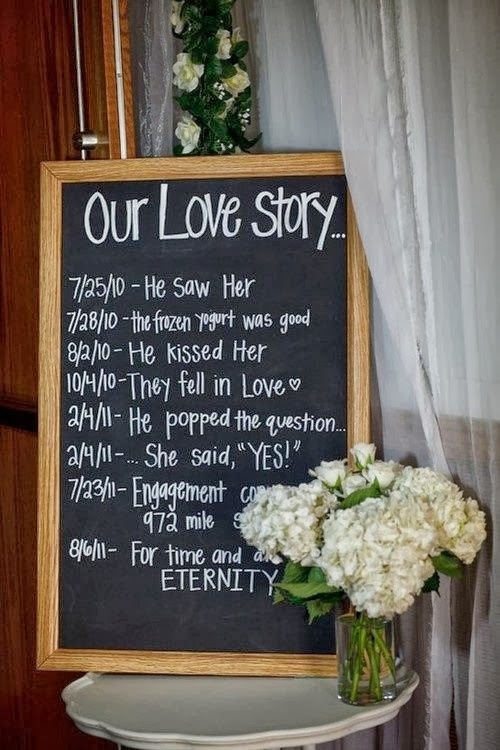 Although I'm now realizing that there seems to be quite a bit of chalk in my fantasy wedding... which is weird for someone who hates chalk. Perhaps dry erase boards would be better. 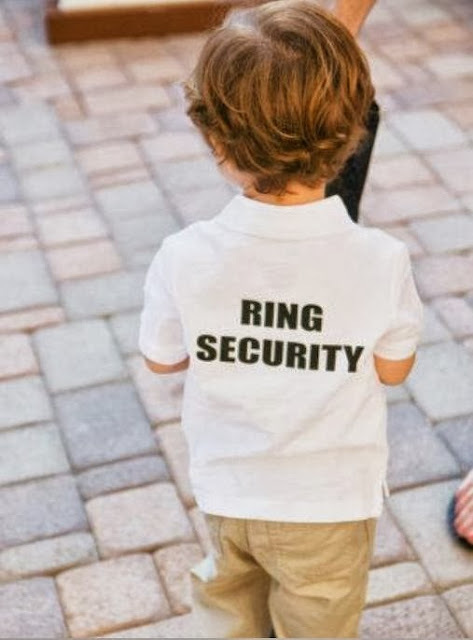 I already have tons for flower girl inspiration but I loved these adorable little ring bearer ideas. 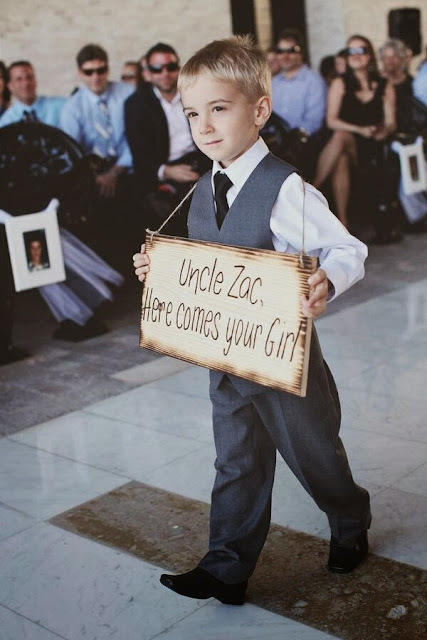 By the way, we have the cutest ring bearer lined up so either of these looks will be major crowd pleasers! What do you guys think? 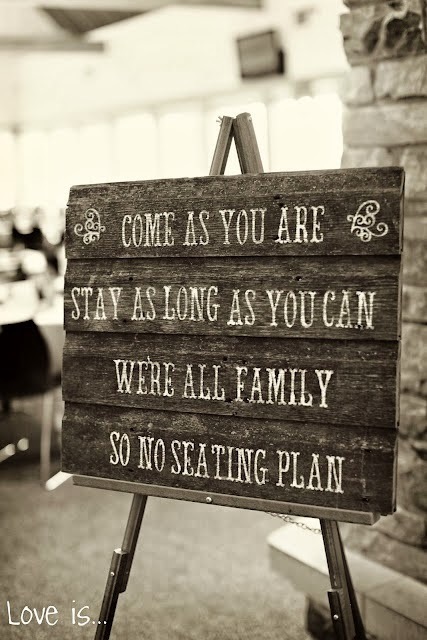 Are any of you doing a little wedding planning of your own?